NES Legacy of the Wizard (USA) in 13:44.23 by Lord Tom. 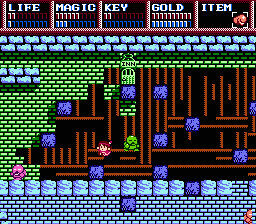 Legacy of the Wizard (1987), released in Japan as "ドラゴンスレイヤーIV Dragon Slayer IV: Drasle Family", is actually a part of Dragon Slayer series. This is a nonlinear platforming adventure game, in which you gain control over one member of the Drasle family to explore the vast dungeon filled with mind bending puzzles and obscure secrets. The goal of the game is to retrieve a powerful sword named Dragon Slayer, protected by four magical crowns, to kill an evil dragon trapped in the nearby labyrinth. Each member of the family has different abilities, and the portion of the labyrinth only he/she can go into to retrieve one of the crowns. However, this prerequisite was circumvented by the clever use of certain new glitches. According to the author, this movie employs a completely different route, better luck manipulation and some new tricks that result in a 3:38 faster movie than the previous version. Moral of this movie: Beware of short fat men, for they're surprisingly quick.